Whelp - I missed the opportunity to shoot the squirrels in their baseball getup. 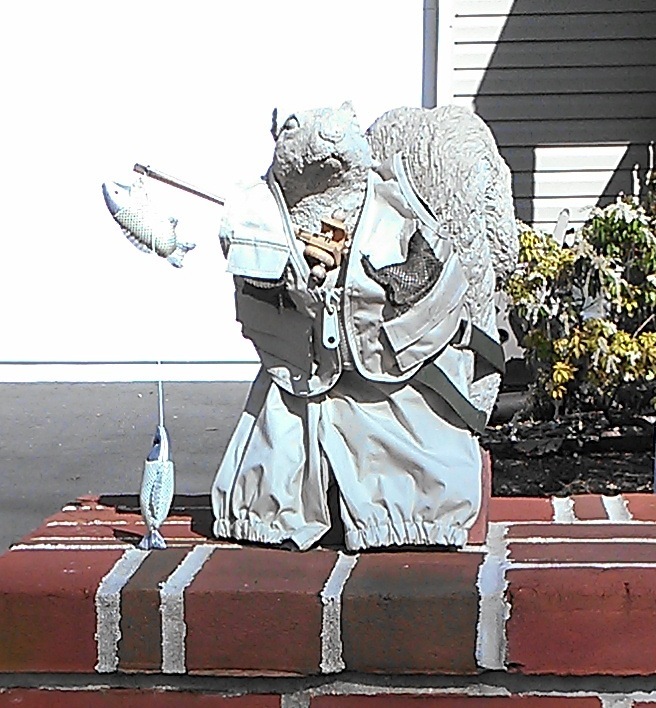 I figured I had more time, but as always the squirrel ladies don't let the rodent fashion get too stale. Today they're in full fishing regalia -- pants, vest and rod. Got one! Even if it is smaller than the lure. Actually, I just realized you can check out the baseball squirrels from an earlier post -- sure they were in honor of the playoffs, but they look the same. Also, speaking of inertia, today it's the scapegoat for the lack of progress on my novel. As they say, a writer at rest stays at rest (until, of course, she opens the story file and adds one or two or three words in an effort to get the train moving). This train has been at the station, too long. Last night I was hiding behind a pillow on my sofa (as I'm apt to do when I'm attempting to escape the sinking feeling that whatever endeavor I'm ...endeavoring on ... isn't going well or when there's a scary movie on ... or when I'm embarrassed to be watching "The Real Housewives") and I acknowledged (out loud!) to Brad that the real problem here isn't time, it is conflict. As in a lack of conflict. I have characters, plot, a setting but I'm struggling to figure out what the heck the conflict is. What are the stakes? Where's my rising action? What will the resolution be? Where the heck is this locomotive going? By now you're thinking I'm the Ralph Wiggum of storytelling. "Me fail English? That's Umpossible!"